San Jose, Costa Rica, where we began our trip, is at nearly 4000 ft, cool and surrounded by mountains. Panama City, where we ended is at sea level and hot with a modern skyline making for a huge change in climate and atmosphere. We began at a coffee plantation in the mountains and ended on a ship in the impressive Panama Canal. Wow what a contrast. Transiting the Panama Canal and also spending some time in a small boat on the canal. The boat took us into one of the many "inlets" of the canal created by the flooding of the Chagres river when the canal was built. The surroundings have been left as a jungle where we saw monkeys, a large crocodile and a number of birds. Totally unexpected. The hotel choices were good and there was plenty of food. Lots of activities for the kids. But, we expected nature walks/hikes for the adults and the kids. That never happened. Where were the talks regarding ecology, wildlife, geology, whatever? The one and only wildlife talk we had was regarding insects, which was great and enjoyed by all. The most indelible image of Costa Rica was the rain forest and foliage. But if you ask my granddaughter, what she loved the most was the zip line and rafting down the river with the other kids. I genuinely enjoyed the visit to a wildlife rescue center, the chocolate factory and the pineapple plantation. Would have liked a hike though the forest. The tour director was well-organized and managed the local guides really well. My only disappointment was that only 1.5 hours was allocated for the Great Wall of China, even though I could have spent all day hiking it. The dinners provided thorough samples of Chinese cuisine but were sometimes very long and tiring, exceeding 2 hours. The Hutong ride in Beijing and the balmy sunny weather during the transfer to my international flight home made me contemplate the charms of possibly living in Asia. In 1882, Herman Tauck arrived in New York City from Germany in search of the American dream. His determination and values were passed on to his son, Arthur Tauck, who would realize that dream. With ingenuity and an innovative spirit, Arthur started Tauck Motor Tours, a travel company that would give birth to a new industry. The first tour, through the back roads of New England, was created by this 27-year-old in 1925. It embodied the same successful formula used by Tauck today: do the right thing. Craft a life-enriching travel experience; provide it at a single all-inclusive price; ensure there is great value for money; and rely on recommendations of satisfied customers to build a following and grow the business. Two elements that did change over the next 90+ years – and three generations of Taucks – were the scope of destinations served and the variety of modes of travel used. Today Tauck delivers life-enriching travel experiences to every corner of the globe, incorporating small cruise ships, premium riverboats, trains, helicopters and more. What started as a New England motor coach tour company has truly evolved into an extraordinary global travel company. 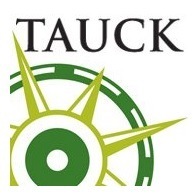 The fourth generation of Taucks is now involved in the company. While remarkable in any business, this seamless continuity across generations speaks to shared vision and values. Throughout its history, the concept of “family” at Tauck has gone far beyond those sharing the surname to include hundreds of valued employees, and hundreds of thousands of loyal guests. The story of Tauck is the story of a unique American family company celebrating a passion for travel – a story that will continue to inspire generations to come.